Vinyl, composite, and PVC fencing are becoming more viable options over traditional wood fencing, in many parts of the country. The reasons are compelling. Compared to wood, the three are virtually maintenance free. Insects and rot are not a problem and they won’t split, crack, or splinter. Vinyl and PVC fencing are made of completely synthetic materials, while composite is made of a combination of plastic and wood fibers. There are some differences in installation compared to wood fencing. For example, many fence systems, especially vinyl, cannot be cut and adjusted with the freedom that you can with wood fencing. Essentially, the installation tolerances are very restrictive. Measurements from post to post need to be extremely accurate. At the same time, you must allow for expansion and contraction. This is where many do-it-yourselfers run into difficulty down the road. A vinyl fence that is installed too tightly on a cool morning can become warped and wavy once the sun comes out. Since vinyl, composite and PVC fencing are so long-lasting, make sure that the hardware you use is equally so. Stainless steel hardware is the best choice. 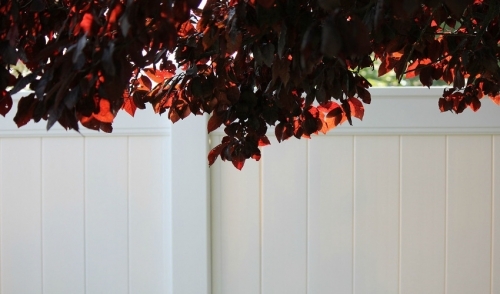 The last thing the homeowner wants is oxidation or rust stains marring the clean finish of their new fencing. It is to be noted that not all vinyl, composite, and PVC fencing is created equal. At the lower end of the spectrum, materials are relatively thin and brittle, while at the higher end are products such as Certainteed’s Bufftech™. A good gauge of quality is in the cutting. The better product will create dust when cut, while the inferior one will likely shatter into chips. Fastening is no different. Cheaper grade fencing systems utilize a bracketing system for fastening. The drawback there is that the brackets are 90° and can’t be installed on an angle. That can be a problem on slopes, which means that the fence must be installed in such a way that it “steps” up a hill. While that is a perfectly acceptable practice, some customers prefer that the fence follows the slope of the land. Many of the fencing systems used by the pros utilize a “rout and lock” system of connection. The rails slip into the pre-cut openings in the posts and are secured from within. This way, the rails are firmly locked into place, allow room to expand and contract, and still accommodate for the slope.